Thus far in 2014, the ten highest prices paid for classic cars at public auctions were all for Ferraris with a 1962 Ferrari 250 GTO the most-expensive car ever. The ten most-expensive cars sold at public auction in 2014 were all Ferrari models. The dearest car in 2014 was a 1962 Ferrari 250 GTO sold by Bonhams at the Quail Lodge sale in Carmel for a world record $38 million – the highest price ever paid at public auction for a car, which naturally makes it the most-expensive Ferrari ever too. Although Bonhams took the top slot, RM Auction sold six of the cars on the top-ten list of most-expensive cars in 2014. Gooding & Co and Rick Cole have one car each on the list. Six of the highest results in 2014 were achieved at collector car auctions during the Monterey classic car week in mid-August 2014. 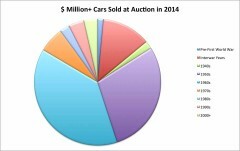 At least 200 cars have sold for over a million dollars at public auction in 2014 – more than a third were Ferraris. *Prices include auction premium. Sales not completed on auction day are not included – see two Ferraris sold by Rick Cole below. Ferraris traditionally dominate the lists of the highest prices paid for classic cars at public auctions but this is the first time that all ten most-expensive cars sold in the year have been Ferraris. In 2013 and 2012, six of the top-ten most-expensive cars were Ferraris while in 2011 “only” four were from Maranello. The most-expensive non-Ferrari branded car was also the eleventh dearest car of the year: a 1964 Ford GT40 Prototype sold for $7 million (hammer price) at the Houston auction of Mecum in April 2014. The 1962-63 Ferrari GTO Berlinetta sold by Bonhams at the Quail Lodge sale in Carmel in August 2014 achieved a world record $38,115,000 – the highest price ever paid for a car at public auction. It is thus obviously the most-expensive Ferrari model ever too. GTOs have been rumored to trade for around $50 million privately but this was the first time in a quarter century that a GTO was sold in an open market. The GTO is a homologation (“omologato”) special of the GT, which gives it some claims to being both the most-expensive road-going and racing car ever. The previous record holder – the 1954 Mercedes Benz W196R Formula 1 car, which achieved $30 million at the Bonhams 2013 Goodwood Festival of Speed sale, remains the most-expensive purely racing car ever. See 1962-63 Ferrari 250 GTO for more on the new world record holder. The 1964 Ferrari 275 GTB/C Special by Scaglietti was the second most-expensive car in 2014. It sold for $26,400,000 at the 2014 RM Auctions Monterey sale. This beautiful automobile is one of only three 1964 Ferrari 275 GTB/C cars ever built, making it even more rare than the famed GTOs. A sister car still holds the record for the highest finish ever at Le Mans by a front-engine car – third in 1965. The 1954 Ferrari 375-Plus Sports achieved £10,753,500 ($18,309,613) at the Bonhams Goodwood Festival of Speed sale in June 2014 in the United Kingdom. It was the highest price paid for a classic car at public auction in Europe in 2014. It was also the most-expensive purely racing car in 2014 and the highest price ever paid for a Ferrari racing car. Only 56 California Spiders with coachwork by Scaglietti were ever built on the short-wheel base chassis with only 37 having the more desirable covered headlights. The 1965 Ferrari 275 GTB Competizione Clienti achieved $12,000,000 at an online auction arranged by Rick Cole during the 2014 Monterey Week. Ferrari built only 10 of the 275 GTB/C in 1965 primarily with the intention that private owners would participate in races with these cars. However, the first owner Alfred Ducato bought the car with the intention of owning the ultimate road-legal 275 GTB and never raced the car. As a result, it is probably the best preserved and most original of the surviving GTB/C cars. The 1964 Ferrari 250 LM with coachwork by Scaglietti achieved $11,550,000 at the RM Auctions Monterey sale in August. Although built to compete at Le Mans, and a sister car was the last Ferrari to have won Le Mans overall in 1965, a few 250 LMs were sold to private owners for road use. Ferrari built only 32 of the 250 LMs – far fewer than the 100 required by FIA for homologation purposes. A 1967 Ferrari 275 GTB/4 by Scaglietti is the third car on the top-ten list from the record-breaking RM Auctions Monterey sale. It achieved $10,175,000. This Ferrari 275 GTB/4 by Scaglietti, one of around 300 produced by Ferrari, famously had as first owner Steve McQueen. He sensible changed the car’s color for hazelnut (a metallic gold) to red before taking possession. A 1958 Ferrari 250 GT LWB California Spider by Scaglietti that achieved $8,8000,000 at the RM Auctions Arizona sale is the only car left on the top-ten list from the major opening sales of the year in January in Scottsdale and Arizona. This 1958 Ferrari 250 GT was the 11th of only 50 long-wheel bases California Spiders ever made. The car holds the record as the most-expensive car ever sold at the annual January Arizona auction series. A 1956 Ferrari 250 GT Berlinetta Competizione ‘Tour de France’ by Scaglietti achieved £4,872,000 ($8,119,188) at the RM Auctions 2014 London sale. This was the second highest price paid this year for a car at a British classic car auction. This 1956 Ferrari 250 GT Berlinetta Competizione ‘Tour de France’ was the eighth of only nine produced. A 1966 Ferrari 275 GTB/C by Scaglietti achieved €5,712,000 ($7,860,283) at the RM Auctions Monaco sale in May 2014, as the highest price paid for a classic car at public auction on mainland Europe in 2014. The 1966 Ferrari 275 GTB/C by Scaglietti was the 9th of only 12th of these cars ever produced. At the time of the sale, the price was the highest ever paid for a fixed-head 275 – since then more than tripled at the Monterey sale. 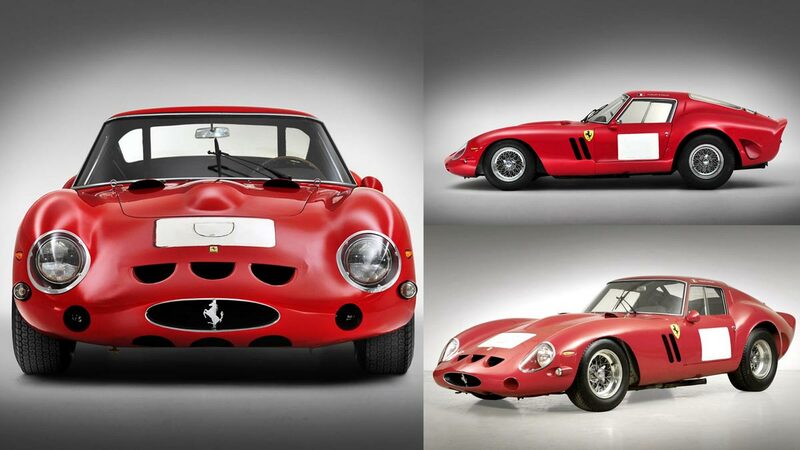 In the battle of the classic car auction houses, Bonhams took the top spot with the record breaking Ferrari 250 GTO. Bonhams also had the top slot in 2013 when the 1954 Mercedes Benz W196R Formula 1 car was the most-expensive car ever at the time of its sale. Bonhams has again two top-ten cars this year – the same as in 2013 and 2012. RM Auctions has sold the second most-expensive car in 2014 and has six of the top-ten list cars in 2014. In 2013 and 2012 had five cars. Goodings & Co was unfortunate not to have taken the third spot this year – a 1966 Ferrari 365 P Berlinette Speciale “Tre Posti” achieved a highest bid of $22 million a the Pebble Beach auction but failed to clear the reserve price. Rick Cole similarly had a highest bid of $19.5 million for a 1955 Ferrari 410 Sport at Monterey that failed to clear the margin. The 410 Sport was subsequently sold for a remarkable $23 million. Following the same Monterey auction, Rick Cole sold a 1962 Ferrari 250 SWB for $9,725,000. At least two hundred collector cars have sold for over a million dollar at public auctions in 2014 (January to end August). The list is topped by RM Auctions with 73 cars – 35 at Monterey alone. Goodings sold 52 cars (30 at Pebble Beach) for over a million dollars each – a remarkable achievement for this auction house, which arranges only three regular sales per year. Bonhams comes third with 44 million dollar plus cars – 19 at Quail Lodge. During the 2014 Monterey week, 98 cars sold for more than $1 million each. Cars from the 1950s and 1960s clearly remained the most desired but prices seem to be rising for 1970s cars too, although still mostly shy of a million dollars. With two Porsche 959s from the 1980s selling for over a million dollars in 2014, more of these German supercars are likely to come to market in 2015. Data included in these statistics are from the classic car sales at Scottsdale and Arizona (January), Paris Rétromobile (February, Amelia Island (March), Houston (April), Monaco (May), Goodwood Festival of Speed(June), Mercedes Benz Museum in Stuttgart (July) and Monterey classic car week (mid-August) including Quail Lodge (Bonhams), Monterey (RM Auctions, Mecum, Rick Cole) and Pebble Beach (Gooding), London (September), Goodwood Revival plus a few further sales where the odd vehicle cleared the million dollar mark.